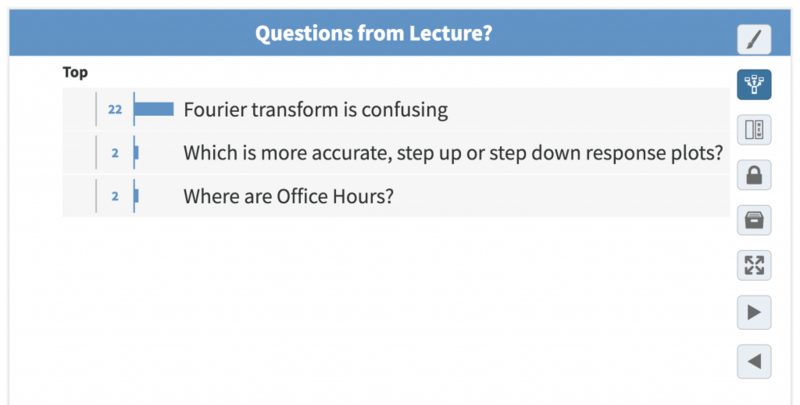 Have you ever wanted to capture questions from students during a lecture? Do you just know students have questions about the content, but there is always silence when you ask them? I’d love to share a really cool and interesting way of using Poll Everywhere in your classes to solve this problem. Dirk Albrecht is using Pollev. in his BME2210 class, with around 100 students. Dirk starts his lecture with point based questions (to later upload to Canvas as participation points) and then switches to a “Q&A” type question, asking his students if they have any questions. This is left up on his Pollev. URL behind the scenes for the remainder of the lecture. Students can keep the link open or pull it up to ask questions or make comments, and other students can “up-vote” them if they too have that same question. The screen shot below shows one student said “Fourier transform is confusing”, and then 22 other students voted it up. With our fast-paced terms, this could be a way to capture where knowledge gaps might occur. This also gives students a space to ask their questions with out a spot light shining down on them in front of their peers, and without interrupting the lecture. If you have yet to set up a Poll Everywhere account at WPI, click here to request access. Feel free to send questions our way at atc-ttl@wpi.edu. « Drop by our weekly Canvas Clinics – starting August 30th!